Bonn, Germany, 30th April 2018…The Executive Director of the Environmental Protection Agency of Liberia, Hon. Nathaniel T. Blama, Sr. is attending the United Nations Climate Change Conference from April 30 to May 10, 2018 in Bonn, Germany. Hon. 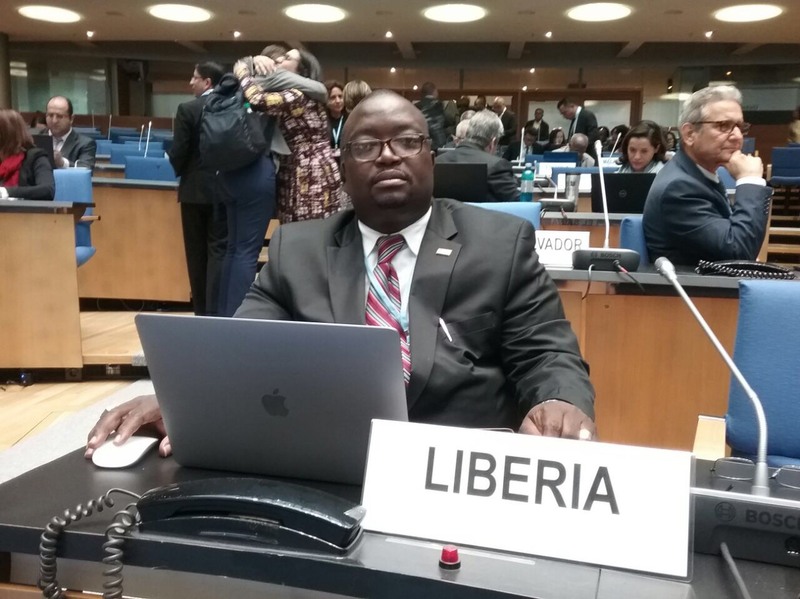 Blama was extended an official invitation as head of the Environmental Protection Agency of Liberia to attend the global conference on Climate change. Attending the conference along with Hon. Blama is Asst. Prof. Benjamin S. Karmorh, Jr., Coordinator, Multilateral Environmental Agreement and National Coordinator, Climate Change Enabling Activities at the Environmental Protection Agency of Liberia who will provide technical support to Hon. Blama during the meeting. The Conference is being attended by more than 190 countries, international organizations, civil society organizations, climate change experts, youth groups and among others. The intersessional UN Climate Conference in Bonn, Germany is intended to address the modalities of the implementation of the UN Paris Climate Change Agreement ahead of the UN Climate Change Conference (COP 24), Katowice, Poland in December 2018. COP 24 is intended to complete the rule set to implement the Paris Agreement. Prior to the UN Bonn Climate Conference, Hon. Blama attended the Second Technical Capacity Building Initiative for Transparency (CBIT) Meeting. The Meeting was held in the German Capital Berlin upon the invitation of the UN Climate Change Partners on CBIT. During the Technical Meeting, Hon. Blama presented a road map on the development of Liberia`s CBIT. The objective of the CBIT is to strengthen the institutional and technical capacities of developing countries to meet the enhanced transparency requirements of The Paris Agreement. During the Bonn Climate Conference, Hon. Blame will also present a progress report of Liberia`s accessing the Green Climate Fund (GCF). Liberia and Nepal are the first two developing countries that have been able to access fund from the GCF to develop their countries respective National Adaptation Plan (NAP). The NAP is intended to address developing countries medium and long term adaptation needs to address the impacts of climate change. Presently, Liberia is developing its NAP through the United Nations Development Programme. While at the Bonn Climate Conference, Hon. Blama is expected to have several side-line and bilateral meetings with international partners. He will inform partners about progress being made by Liberia to address the impacts of climate change and at the same time request for more technical and financial support to address the impacts of climate change especially on Liberia vulnerable communities.